I was inspired to take a closer look at our Alf Mattison Collection after I heard Professor Malcolm Chase from the University of Leeds deliver a talk a few weeks ago to a busy room about this fascinating but somewhat shadowy figure. This was a man who despite his active involvement in the socialist movement from its very beginning in this country remained a background figure in politics. He was close friends with some of the most influential Socialists of the time yet he expressed no desire to pursue a political career himself. It was his personal experiences of the hardships of industrial working class life in Leeds that led him to act against class discrimination and it is through his collection, in the Brotherton Library and in our own, that we have access to an invaluable record of socialism in Leeds. His collection of socialist literature includes a large number of books, ephemera and pamphlets and many of these can be found in the Brotherton Library. He was also a prolific compiler of newspaper cuttings and had a staggering intake of five daily, eleven weekly and four monthly papers. 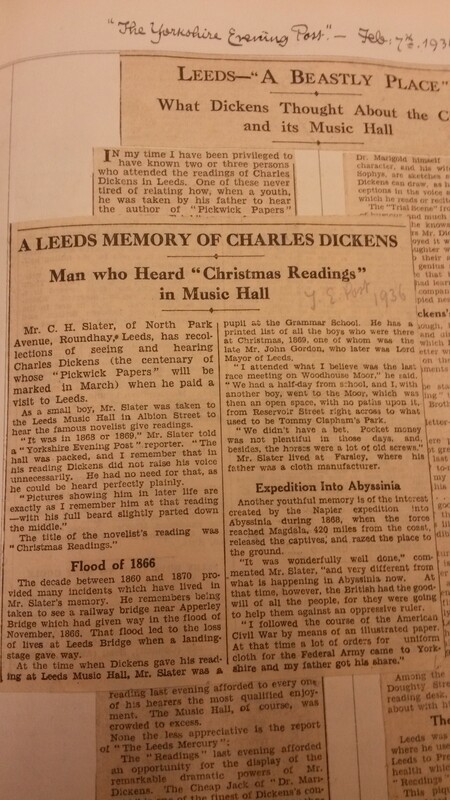 His compilations of newspaper cuttings vary in subject matter and these are a couple of examples found in Mattison’s ‘Old Leeds Chronicles’ in Leeds Libraries’ collections. As well as a collector of socialist literature Mattison was also a keen and well respected local historian, holding office on the Thoresby Society Council from 1908 until his death in 1944. He was regarded as a particular expert on the history of theatre in Leeds and we have his manuscripts on topics such as ‘The First Leeds Theatre’, Tate Wilkinson’s early pantomimes’ and ‘Famous actors appearing at the Leeds Theatre’. 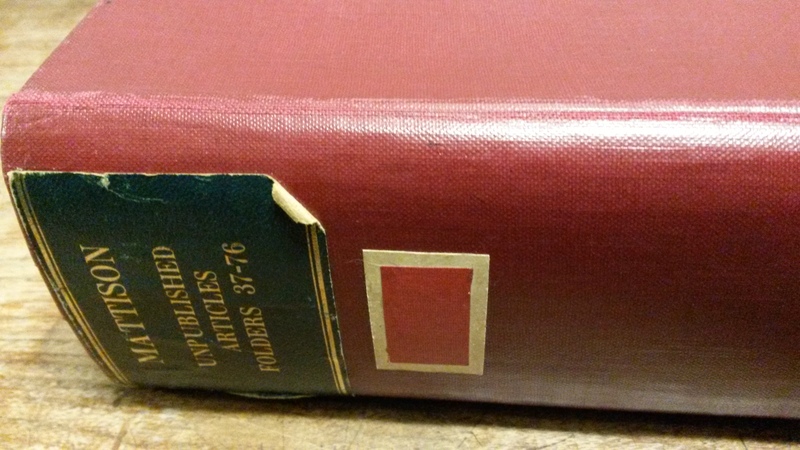 Mattison frequently contributed articles to The Yorkshire Post and Leeds Weekly Citizen but Leeds Central Library also hold a treasure trove of handwritten unpublished material – 76 folders to be exact – that are available to explore. It is perhaps the diaries of Alf Mattison that excited me the most when I discovered the 16 volumes on a shelf in our strong room. He always intended these to be read and he carefully considered where they might be housed best. He believed that they would be more accessible to a wider audience if they were kept in the public library and In keeping with his wishes, his wife Florence gave them to us after his death. The journals are full of stories of famous Leeds figures and visits made to Leeds by notable people, such as, Winston Churchill and Sir Walter Scott. Perhaps one of the most important sections is the one that covers the Second World War. 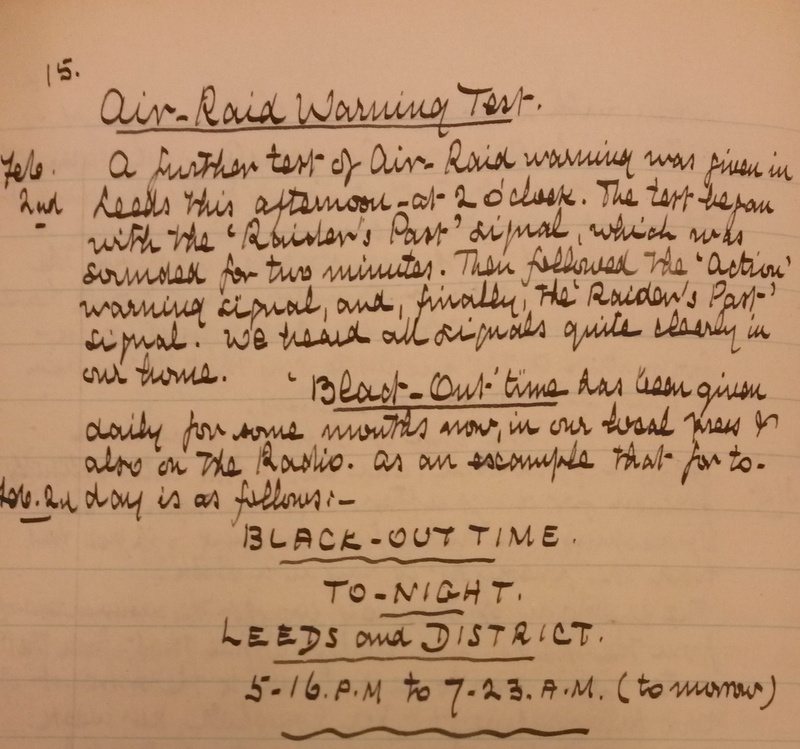 Mattison made many diary entries about significant events but also about how his daily life had been affected by changes to rationing and frequent air raids as he realised that this would be important to future readers. His record provides a unique and personal insight into life in Leeds during the war. His wife Florence or ‘Florrie’ as she was known is also an interesting character, having been expelled from the Labour Party at the age of 76 for being too radical. But she perhaps is deserving of her own blog post! If you would like to look at some of the items from the Mattison collection please come and see us at Leeds Central Library or walk up the hill to the Brotherton, where you can also now visit their wonderful new Treasures of the Brotherton Gallery. Thanks for a really interesting read. So many fascinating people, so many resources and so little time to do justice to them all.